The cover of a regional edition of the highest circulated daily newspaper in Philadelphia featured a news story of my own yesterday. 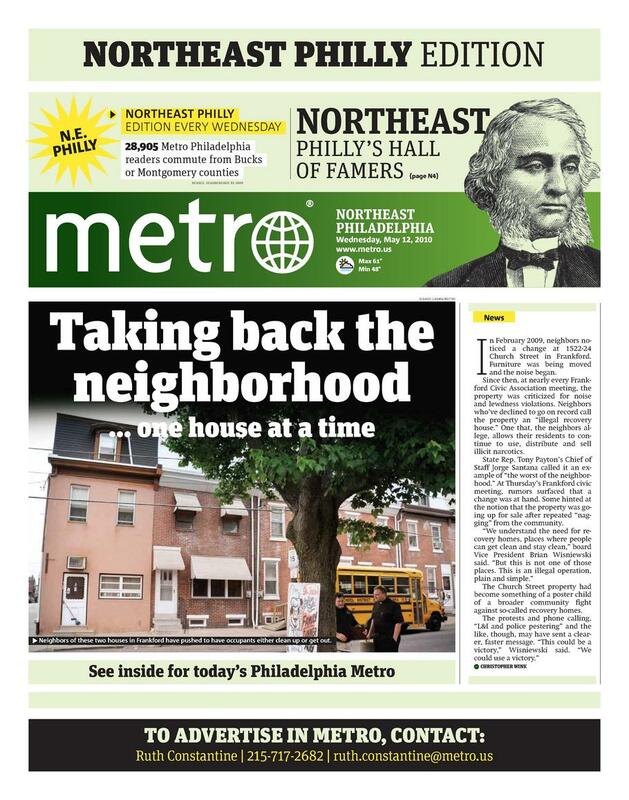 I attended the meeting as a former resident and occasional contributor to NEast Philly, the Northeast hyperlocal, that started last month a content partnership with the Philadelphia edition of the international free daily newspaper franchise. NEast Philly Editor Shannon McDonald says she entered the agreement, which features repackaged NEast content every other Wednesday, for the branding and larger distribution. Metro, which currently only pays McDonald for a feature Northeast freelance piece that usually leads the package, gets cheap content for a niche geographic readership for whom it can sell more direct advertising. But it’s part of a growing direction for the scrappy free daily, which is likely more respected in Philadelphia than in its other U.S. markets of Boston and New York City but still takes heat for its short form, image and graphic driven product. Since announcing the deal on April 29, Metro also has a partnership with noted cityblog Philebrity.com, which offers highlighted nightlife listings for the coming weekend, and has an agreement with election news blog pa2010 and the Philadelphia Business Journal. As eMedia Vitals reported, like the Northeast for Philadelphia, the New York paper rolled out a Queens edition and uses Mashable content on Thursdays. The Canadian arm partnered with FourSquare. The free daily is leveraging independent publishers who want to grow their reach and hit print readers to get free or low cost content and those communities and niches. It’s an angle that print isn’t dead — it just needs some cost cutting and realignment. It seems like a brilliant strategy in my estimation.